With back-stage crew, make-up artists and technical support, some 170 students - from Years 8 to 13 - were involved with the show which was performed to an audience of local primary school pupils last Tuesday and then evening audiences (Wednesday-Saturday) with a Saturday matinee. 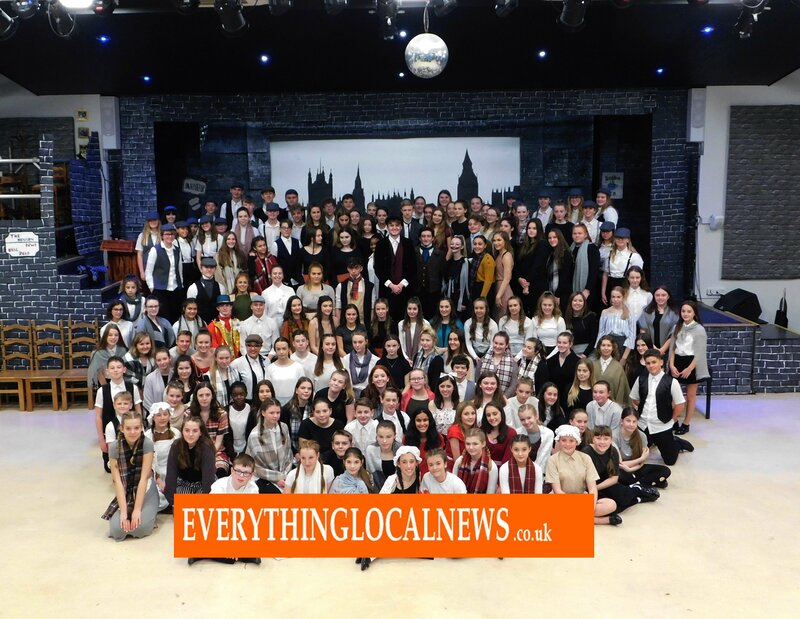 Laura Willcox, the school’s Assistant Head of Performing and Creative Arts - who organised and directed the show - said: "We worked on the show for only just over nine weeks. "We adapted the classic novel of Dickens ‘A Christmas Carol’ into a musical and set it with a range of music - some modern day numbers and some from a variety of other musicals that people would recognise." She added: "This year we really tried to incorporate an equal amount of all disciplines within the Performing Arts - we had more dance and production numbers, more solos and an elaborate and detailed set which was created by our Art department and co-ordinated by Paul Butler, Head of Performing and Creative Arts. "The school's theatre was transformed into olden day London streets for Scrooge to dominate. The layout truly made the best use of the space and created a dark and traditional atmosphere to set the production. Matt Bryan, who designed the programme, said: "It was a brilliant performance. Just how the school managed to showcase all its students' talents and weave them seamlessly into the story, I will never know." Laura Willcox added: "The production featured a range of larger-than-life characters including the angelic yet haunting Ghost of Christmas Past, played by Ruthie Banks; the comic and jolly Ghost of Christmas Present, played by Finley Walton; and the chilling and silent Ghost of Christmas yet to come performed by Anya Gray. "Taking the lead role was Daniel Hall, who was outstanding, and more Scrooge-like every night, leaving the audience in absolute awe. "His adaption of Scrooge was endearing and really encapsulated the struggle and journey Ebenezer faces. "His singing and dancing were fantastic - an absolutely outstanding performance. Another standout performance was from Elinor Dunton. "Her role of Mrs Cratchit was well undertaken especially with her rendition of 'My Boy'. "Among the audience at the last performance was the Chelmsford Mayoress who offered some kind words of congratulation and praise to the cast. "It was an immense success and the staff involved are so proud of what the students achieved. "It was yet another outstanding production from Boswells students. Well done to them all." "We've just seen the matinee of 'A Christmas Carol'. Brilliant! It was so good and everyone seemed to thoroughly enjoy themselves. The set was excellent and it looked like you had somehow widened the hall. "It was obvious that a lot of hard work had gone into the whole production and the students are a credit to you and the team. "Thank you for everything you do. It is definitely appreciated." "I just want to say what an amazing show last night. All the cast were fantastic, so much talent on stage. Thanks to all the staff for all their hard work that was put into all aspects of the show. "Really looking forward to watching the show again tonight." "I just wanted to say the production last night was absolutely superb. I’ve been to a few but last night's was exceptional and really enjoyable. So many talented kids! "Huge well done to you both and your faculty." Issued by the Everything Local News media service - www.everythinglocalnews.co.uk. The Everything Local News media service does not pass on email addresses to any other organisation. Subscribers to Boswells School media releases can ask for their contact details to be amended, or request that they are removed from the circulation list, at any time.